Rare collection of 11 different magazines with X-Files covers and content from 1995 through 1997, with Gillian Anderson and/or David Duchovny featured on the cover. 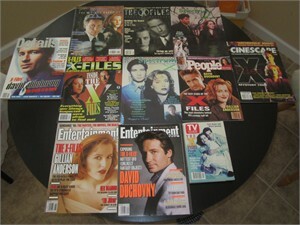 Includes Entertainment Weekly, TV Guide, Cinescape, Details, etc. PRISTINE CONDITION WITH NO SUBSCRIPTION LABELS. ONLY ONE COLLECTION AVAILABLE FOR SALE.